I'm finally back with a bullet journal update! Last time I filled out my journal was in June but I did play around with it since then I just haven't shared anything because I felt like my pages weren't anything special. I started a lot of trackers but didn't keep up with any of them and would feel embarrassed to show you guys my sad failed attempts. However, I'm back! 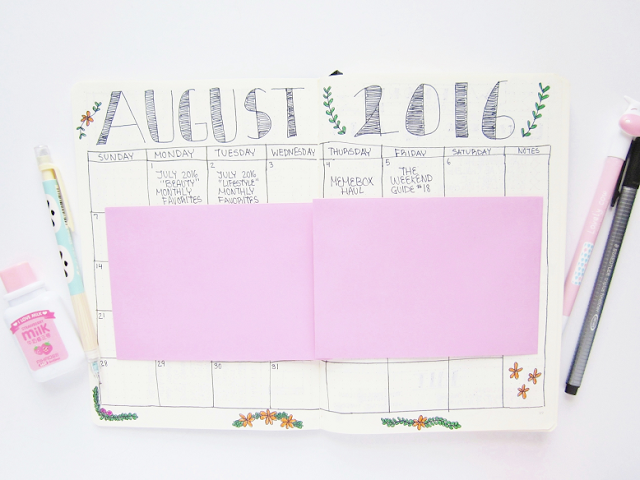 Today I will be unveiling some of the pages that I made for August. 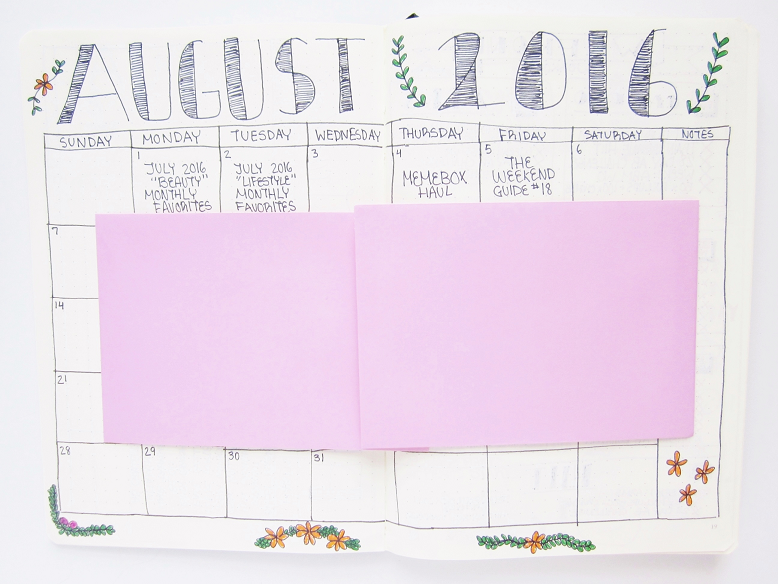 This is the monthly calendar I made for August. I like using calendars like this to track my blog posts. It really helps me with my posting schedule. I covered the next few weeks because I didn't want to spoil any upcoming posts. I also doodled a bit around the calendar by drawing flowers and leaves. On left I made a spending log to track how and where I spend my money. There is 5 categories on the top including date, cost, store, balance and weekly balance. I regret writing both balance and weekly balance because I only really need one. Down at the bottom I have start and end balance. I haven't filled out the start so already feel like this isn't accurate. Hopefully, I can keep up with this spending log though! 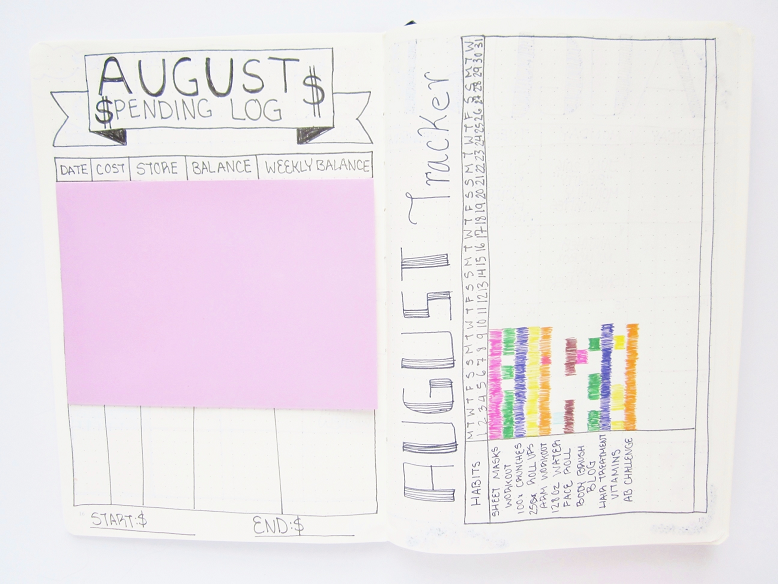 On the right side I have my August daily habit tracker. 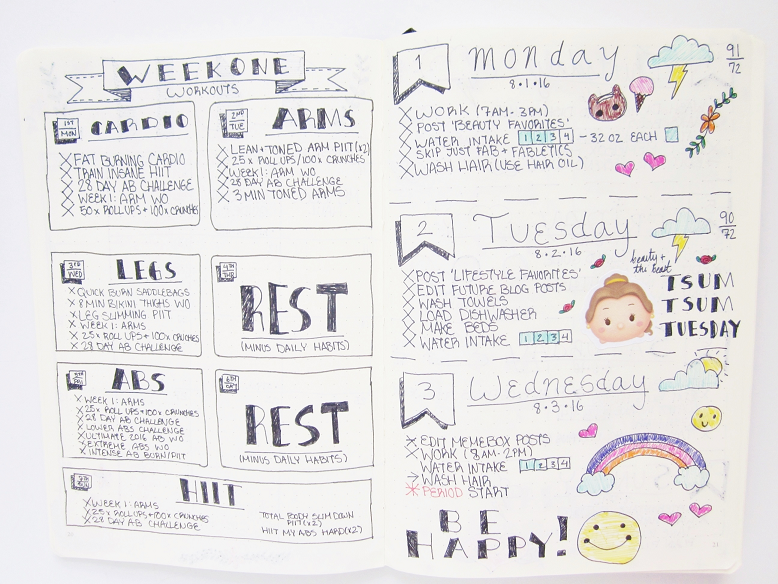 I really like the idea of this, you write down some habits you want to start adding to your daily routine and fill in the days you complete the habits with colored pens. So far I'm doing pretty well at most of the habits but I am struggling with body brushing and drinking 128 oz of water a day. 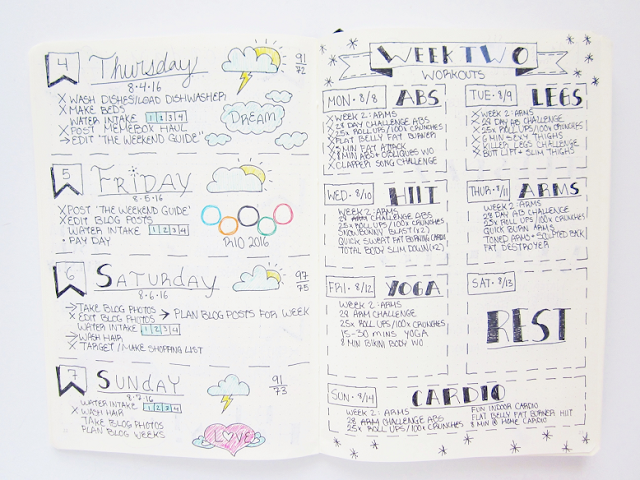 Here is week one of my weekly workout calendar. I haven't exercised regularly in more then a month so I'm ready to start again! Previously, I kept up with the Blogitlates monthly workout plan but now I'm trying to customize my own workout schedule (because I honestly don't enjoy Pilates too much). I still follow most of the Blogilates calendar but in my schedule I take out some of the workouts and add in other workouts. On to my first weekly spread for August. I'm trying lots of new things like playing with more color, stickers and even adding details to the date headers, I'm not sure if I like any of the designs though. Since I'm still new to bullet journaling it will take some time until I can be happy with my weekly setups. There is the second part of my weekly setup on the right. Again. I experimented with new designs but I still don't really like any of them. I actually ended up loving the design I made for week 1 of my workout schedule so I made another one for week 2. On the other side of the page I started my second week of weekly calendar but I will wait until next time to share that with you! 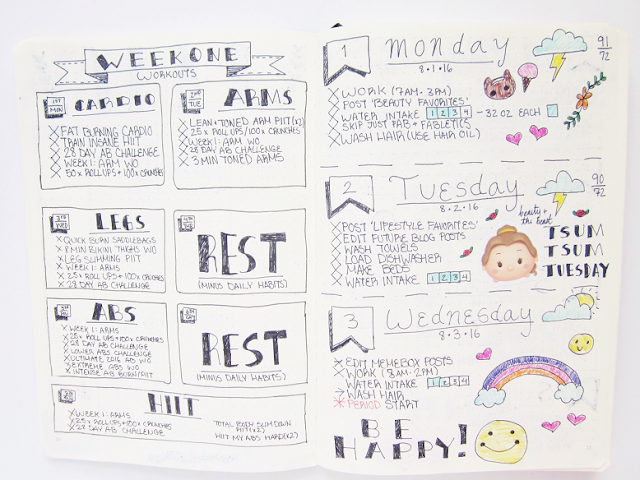 Do you want to see more bullet journal pages?